What better way to herald Children’s Day than to talk about books for children? 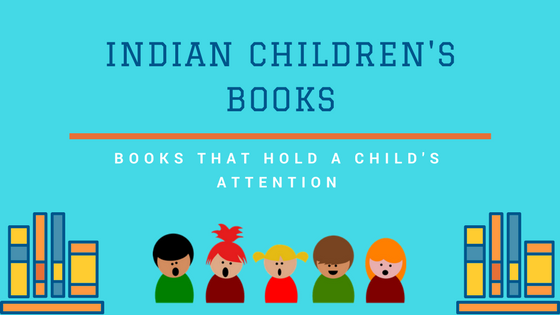 And what better topic to discuss than the Top Indian Children’s Books and their Authors? Priya Narayanan, author of a children's book The Moon Wants to be Spotless White, tells us all about the children's books she has loved. Writing for children is no mean task. To hold the attention of a 4 year old through 8-10 pages of a picture book, or that of a 12 year old through 100 pages of a novella, is amongst the most underestimated tasks I’ve known. Moreover, writing for children involves stepping into their world on the one hand and looking at our world through their eyes, on the other; all the while remembering not to talk down to them or be preachy. So, I am only too glad to recommend some Indian authors and their books, which in my opinion, have hit the jackpot. Younger children adore colourful and vibrant pictures, and Indian publishers have started catering to this segment in a big way. Lets explore books by the famous authors who have big names in Children books writing. Dinosaur-Long-As-127-Kids : The illustrations in this book were done with crayons on paper, take a look. Checkout this review before you buy the book. Days with Thathu : A little girl talks about her days with Thatha, her grandfather. Read detailed review of Days with Thatu. The Famous Smile : A delightful book, with a simple idea that will bring a smile to your child's face. A short review by Young India Books. What Shall I Make : A ball of chapati dough can turn into almost anything! The endearing illustrations follow the quirks of a child’s imagination. "This book is so adorable, I even read it in my son's Montessori class – after which we all did some "chapati art" and had a chapati snack!" – says a reader. Buy this book. 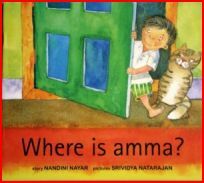 Where is Amma : This is the kind of story that will make you smile; innocence and ingenuity jump out of the pages and quickly make friends with you…Read a review. Pranav’s Picture : Pranav says he is drawing a picture. But his mother sees nothing on the page! What is Pranav drawing? 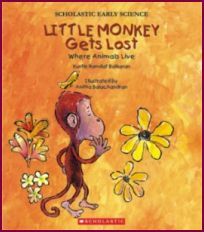 The narrative and freewheeling illustrations follow the simple, spontaneous logic of a child’s mind. Story by Nandini Nayar and colour pictures by Vishwajyoti Ghosh. Buy this book. The Royal Toothache : Even the king of the jungle must keep his teeth clean. Read this sweet story about who taught him this important lesson. Read the review here. Playtime : Golu and Chhotu sure make a funny pair. Read about their antics in this funny story. 4) Kuntie Ramdat Balkaran is a graduate of the University of Guyana and has published two picture books. 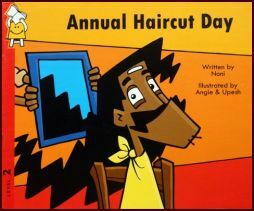 Annual Haircut Day : Read an interesting review of the book. Buy the book from iTunes. The Rumour : Join the villagers of Baddbaddpur in this charming folktale retold by Anushka Ravishankar with illustrations by Kanyika Kini in inks and color pencils that will make you laugh out loud. Here is a review you should read. 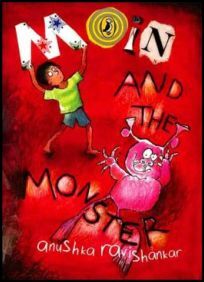 Moin & the Monster : The book is story of Moin and a monster. The special monster does nothing but eat bananas, sing silly songs and try out new hairstyles. Read this story to know how Moin send the monster back where it came from. Also read what The Guardian has to say about this book. Excuses, Excuses : "Youngsters will delight in Neel’s fantastic excuses… The illustrations, a collage of tinted photographs and art, provide an appropriately surreal backdrop" – a review by Kirkus. Read more reviews at Goodreads. 2) Sudha Murty is an Indian social worker and is the chairperson of the Infosys Foundation. She writes for adults as well as children. 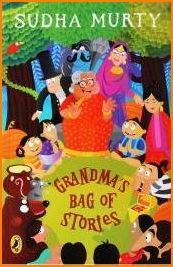 Grandma’s Bag of Stories : Entertaining stories from Gandma's bag. Who would want to miss them! Read what readers at Goodreads have to say. Magic Drum & Other Stories : It's good book for parents who want to read their children a stories. There are many good stories with a good lesson to learn – a reviewer mentioned. Read review at Young India Books. Zigzag and other Stories : The book is a collection of ten stories, from the hilarious story about the weird bird that talks and sings in twenty-one languages, to the singer whose voice makes plants grow faster. Wedding Clothes : A simple short story book. Know more about author and her other books. 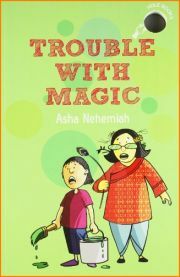 Trouble with Magic : Nine-year-old Veena is brimming with ideas that send her and her beloved Aunt Malu careening on adventures. These well-intentioned enterprises often end in disaster, but that hasn’t deterred Veena yet. She’s always back with another brilliant idea – this time to help Aunt Malu get rich…read more review at theswaddle​. 4) Devdutt Pattanaik needs no introduction; he has gained the reputation of being the Mythology Man of India. Few know that he writes for children as well, under the 'Fun in Devlok' banner. Kama vs Yama : A little girl learns how to balance work and play when she meets Yama, the god of Dharma (duty) and Kama, the god of play. A fabulous way to introduce mythology to your child, without boring him or her! For more insight, read this review. 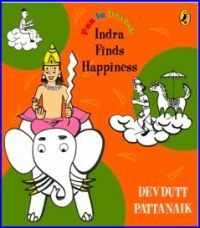 Indra Finds Happiness : A child learns about happiness : is it related to material possessions, or does it go beyond having all the things you want? 1) Salman Rushdie, famous for his award-winning books for adults, has written two books for children. Each was written keeping in mind his own sons. Brimming with enchantment and lyricism, as well as Rushdie's forte, magic realism, these are must-reads for kids and will help introduce them to his works aimed at adults. 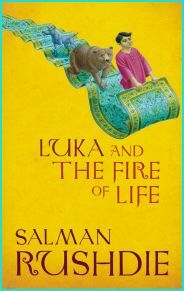 Luka and the Fire of Life : Luka, the boy with the power to turn back time, finds himself in the middle of a hair-raising adventure when he curses a cruel circus leader, gets himself befriended by a circus dog and circus bear, and sets out into the World of Magic to save his father's life. The richness of this story should come as no surprise to adult fans of Salman Rushdie – but kids are sure to be struck by wonder! Haroun and the Sea of Stories : Haroun, the young hero of the stories, lives in a sad, sad city which has forgotten it's name. The adventures he undertakes are an allegory for several problems existing in the Indian subcontinent. Check out the NY Times review for the book. 2) Ruskin Bond will remain an eternal favourite for Indian children. Kids will find his descriptions of life in the mountains enchanting. Many of his short stories are familiar reads for schoolchildren, as they have been part of the syllabus for decades. 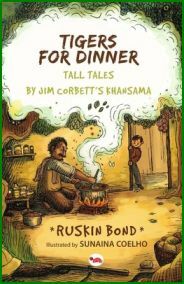 Tigers for Dinner : A cook, who boasts of having been 'Jim Corbett's khansama' tells his starry-eyed young listener (the author himself) stories of the man-eating jungle cats and near-fatal escapades he experienced during his earlier employment. But are the stories true? Read the book to find out! The Adventures of Rusty : Partly autobiographical, this novel is written in a simple descriptive style and spiced with his trademark gentle humour. Here's a review. 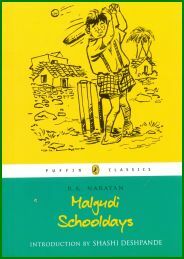 Malgudi Schooldays: Western children's literature is littered with the 'mischievous boy' character – Dennis the Menace, Calvin, William Brown etc. The Indian version – Swami – is a much deeper exploration of childhood, particularly a childhood spent in rural India. Children will empathise with Swami and his schooldays in sleepy little Malgudi town, and adults will be filled with nostalgia. For a detailed review, here you go. 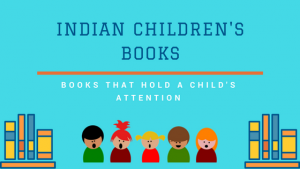 Although Indian authors have been writing meaningful and important books for children since long, they have by far been neglected by a publishing industry that has mostly preferred to play it safe. Other than a few exceptions, most shelves of bookstores were chock-a-block with titles by Enid Blyton, Hans Christian Andersen and the Grimm Brothers for the younger kids, and Nancy Drew and Hardy Boys for older ones. Although I did enjoy all these offerings and more, the characters in these books were not me; their context – either geographical or social – was not mine. What about 1year olds or younger than that? I have a 6month old baby & im thinking of ways to read to him. Its great that you’re thinking of reading to a 6 month old. Children of that age require a visual stimulus to accompany readings because that will help them co-relate sight and sound. So picture books with large illustrations and some rhythmic writing is what you should go for. Also, make sure there aren’t too many pictures on a page. I’ve found picture board books with a touch and feel aspect particularly good for this age group. Unfortunately, there aren’t many such books by Indian authors. A few books that come to my mind right away are: Boodabim by Tulika books, Alphabets are Amazing by Tara books, My Family, This & That, Aloo, Maloo, Kaloo, Chhuk Chhuk Chhak from Pratham books. Book shopping for such young children is actually a lot of fun. So I suggest you go to the book store and spend some time looking around – if you find the time, of course. It’ll be a much needed break for you too 🙂 Have fun! Wonderful to see many of our books on this list you have curated. Thank you Priya for including us as well as recommending our books in the comments. So many of my favorite authors and books on this list. Thank you, Priya Narayanan. Erm, Priya, I hope I was never cocky enough to think I could write better stuff than the market offered! Thank you for this lovely list. What a wonderful surprise to find three of my books on your list! Thank you! Thanks Madam, finally I found the books for my 10 year old daughter. I didn’t want her to read book authored by foreigners. Your titles stopped my search for books for my daughter. Thanks indeed. Do keep updating these comments with other wonderful children’s books you find. We’d love to keep this list up-to-date with the best Indian writing for kids! This list is great and I can’t wait it read them with my daughter as she grows. Now, my daughter is half Goan. Can you recommend any authors from Goa? Thank u this will help a lot in my sons english quiz .